Check to see if the item(s), you are planning to donate is on our acceptable donations list. Our business pickup service is free and we pick up in the seven county Twin Cities metro-area! There are two different ways you can schedule a pickup: Online or over the phone. Online. Request a Pickup page, enter your zip code and business name along with what you’ll be donating, and our donations team will reach out to you within two business days. By phone. Call (612) 305-7245 and we’ll walk you through the process. All of the proceeds from sales at ReStore support Twin Cities Habitat for Humanity programs. In 2018, sales from the ReStore alone were able to help sponsor the construction of five Habitat homes, which local families were able to purchase with an affordable mortgage. Twin Cities Habitat for Humanity partnered with 92 local families this past year to become new homeowners. Businesses receive a donation receipt and can write off the donation on your taxes. Learn more about how charitable donations can benefit your taxes. 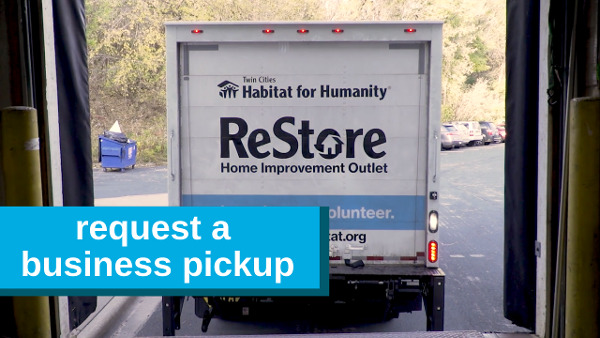 By donating to ReStore, you’re keeping useful items out a landfill and helping Habitat families find safe, stable housing in our local communities.